Cream cheese: one of the many foods that I, a picky eater, missed out on until adulthood. Now, bagels and cream cheese, cheesecake, stuffed french toast…ahh the delight! This weekend we attempted cream cheese. It took 24 hours, but it was very much a hands-off experience. Mixing in a mesophilic starter, waiting, pouring into butter muslin, draining, then salting and tasting. It was very easy, but I’m not sure it turned out correctly. We may have gone wrong with our raw ingredients. Ultra-pasteurized milk won’t make cheese properly. We used it once to make mozzarella, and the cheese tasted fine, but never set into a proper cheese. (It made a yummy cheese dip though.) This recipe called for light cream or half-and-half, but after searching all over town, none could be found that wasn’t ultra-pasteurized. So, we used half heavy cream and half whole milk. Ingenious? Or folly? We can’t really say. 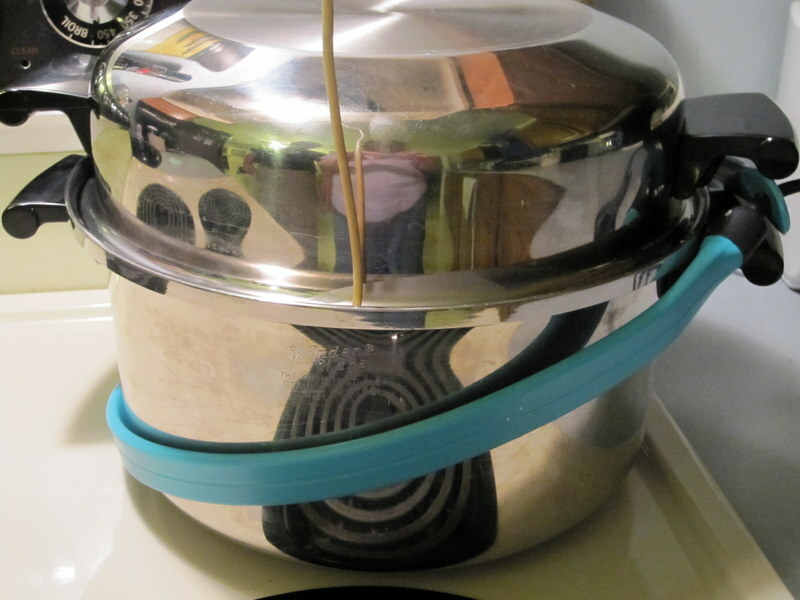 However, it isn’t adjustable, and so it kept the pot a bit too warm. When I checked it the next morning, the cheese when somewhere in the 80 – 90 degree range. So, next time, no pot warmer. Maybe we’ll just pop it into the oven overnight so it can retain its own heat. This is what it looked like – that’s the thermometer probe. It had done quite a bit of thickening overnight. Next, it was poured into a colander lined with butter muslin and hung to dry for 12 hours. We changed the muslin once, and could see the change as the cream cheese gave up some of its moisture. Pretty. Creamy. And the flavor? Well, a bit like sour cream. Hm. We even looked up the recipe for sour cream, just in case our substitution, or the overnight temperature, had given us sour cream instead of cream cheese. But no, that doesn’t seem to be the case. After salting, it tasted a bit more like cream cheese. We flavored some with basil and left the rest plain, with plans of cream cheese brownies next weekend! Are there any cheese-makers out there who know what went wrong? Or is this how fresh cream cheese is supposed to taste?